Well, it improves on some ways upon the previous, but I admit I’m not completely sold on Hannah’s philosophy. The book sees Poirot and Catchpool dispatched to a manor house in Ireland, where Lady Athelinda Playford – a children’s author – rules her house with a puckish charm. Despite having a wealth of loved ones and dependents, Lady Playford has announced she is changing her will and leaving all of her assets to Joseph Scotcher, her supercilious secretary. Oddly, Scotcher has a terminal illness, which makes him a strange choice for the seemingly healthy Lady Playford to assign as her heir. What on earth is going on? It’s perhaps not wise to demand too much literary merit from a Poirot book – after all, it’s not as if Christie was Tolstoy. Her occasional forays into subtler fare, such as Five Little Pigs, are among her best, and some of her Mary Westmacott novels are valuable reading in an Anthony Powell kind of way, but nevertheless she was a storyteller first and foremost. Still, my complaints about this book are primarily literary: the characters almost all sound the same (Phyllis the working-class maid is the only one who exhibits any trace of dialect, despite the novel being set in Ireland); the dialogue is often ponderously laid out, with characters repeatedly specifying times and names or recalling long lists, as if they were all looking at the evidence files while speaking; and – although it’s more taste than style – the decision to split up Poirot and Catchpool for long sections of the book deprives us of spending much time with the Belgian in question. Indeed, the presence of two police officers, a questionably helpful doctor, and the imperious lady of the house all participating in the investigation means that we spend very little time with Poirot until the denouement. 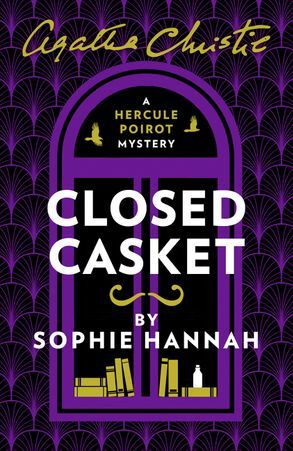 As in her first Poirot novel, Hannah seems to pick certain characters to afford personalities, and others she leaves to one side. It was telling that the few characters who genuinely stood out in Monogram were the outsiders, whereas Hannah treated the genuine suspects like little more than puzzle pieces. If you found that frustrating, you’ll be positively livid about Closed Casket. Despite being vital to the plot, and a potential source of reflection on Christie herself (not to mention the luminous Ariadne Oliver), Lady Playford sits out vast swathes of the novel and never quite breaks free of the page despite clear attempts by the author to do so. A few other characters stand out as well, and not in especially good ways. While the murderer’s quirks can perhaps be justified as clues, less can be said about one especially haughty character whose barbed remarks about everyone else in the book are supposed to come across as psychologically inspired but often have that feeling of strained authorial voice. And the less said the better about Orville Rolfe, Lady Playford’s lawyer. The conceit with Rolfe – the entire conceit, mind you – is that he is morbidly obese but doesn’t seem to realise it. I don’t mind that, per se, but Rolfe spends the novel experiencing buttons popping off his waistcoat (followed by a “golly gee, they don’t make clothes as well any more!”) or having chairs collapse underneath him (followed by a “my word, why don’t they make chairs sturdy these days?). It’s like he was intended for an incredibly non-self-aware cartoon series and got lost en route. Anyhow, the negatives out of the way, I found this an engaging enough mystery to read it over the course of one day. This is a more “classic” Christie mystery than Monogram was, with a country estate, ambiguous servants, a last will and testament, orphans, and surprising coronial reveals. The figure of Scotcher is particularly intriguing, and the relationships within the estate are well sketched out – not least due to a helpful floor plan. It’s frustrating, perhaps, that so much of the solving of the mystery requires Poirot to journey back to the city to gauge backstory for our characters. This is not uncommon in Christie, certainly, but it forces the reader in the direction of certain characters – even if you can’t actually figure out the solution – and, especially galling, leaves us deprived of the crowded, claustrophobic atmosphere that pervades the best “country house” Christie tales, even when they are not actually set in a country house (see Death on the Nile). Again, Hannah shows her love of complicated solutions – although perhaps these are necessary in our day and age, when readers are so accustomed to tearing apart works for clues – and it’s not as convoluted as Monogram was. This fulfills for me that most important of Christie requirements: you can’t fathom how anyone could commit this crime yet – upon the reveal – you can’t see how anyone else could ever have done it. I’ll concede that I’m not sure Sophie Hannah is the ideal successor to Dame Agatha, but then again I also recognise there were a few ways the Christie estate could have gone. Complete revisionist approach (never going to happen). A voice designed to mimic Christie rather than be its own person, creating carbon-copy mysteries that would perhaps have suffered by mere imitation. Or to take the third way: a writer with enough love for Christie but with a determination to do things in her own style. It’s a passable read, but I hope this is only a warm-up for better things to come. Poirot – and, for that matter, Catchpool – deserves only the best. Can it be true? Has the Agatha Christie Reader risen from his long slumber? Praise be to the gods of detective fiction, for this is the most enjoyable, insightful and eloquent blog on the subject. Keep those posts coming, and you’ll make this Dutchman very happy. Coos, thankyou for your kind words! That really is a lovely thing to say. My slumber has been longer than expected, but I am busily watching adaptations from the last three years (and about to read the new Sophie Hannah book) in the hopes of returning to my former glory. Thankyou from the southern side of the world! This is the best Agatha Christie resource on the internet. I’ve been following for years. Please keep writing. I’d love to read your thoughts on the three new BBC adaptations as well as the Branagh Orient Express. Thanks for all that you do. Josh, this is one of the sweetest comments anyone has ever left me. Thankyou for reading! I feel bad for being primarily absent the last few years, and rest assured I have begun writing my thoughts on the BBC adaptations, Branagh, and the recent Crooked House film. I am on my way to the bookstore this morning to purchase the new Sophie Hannah – so I’m hoping that the next couple of months will see a flurry of activity here!